The world can listen to a radio interview with Buffalo, New York most talented indie Gospel singer-songwriter. Gospel recording artist D’Mott appeared live on air with talk show host “Lady Rie” from the Sunday morning radio show at WLQM 1250 AM in Virginia. Tune in below and listen to D’Mott discuss his new project “So Addicted” and more. De’Juaine G. Motley or D’Mott, as he is affectionately known embarks on his new chapter of his music ministry. His desire is to encourage men and women through the Gospel. He is demonstrating that God’s grace and mercy are real and they are brand new every day. He wants listeners to know that throughout life there will be a testimony and it will help others in some way or form regardless of what they did. God’s love will never change. 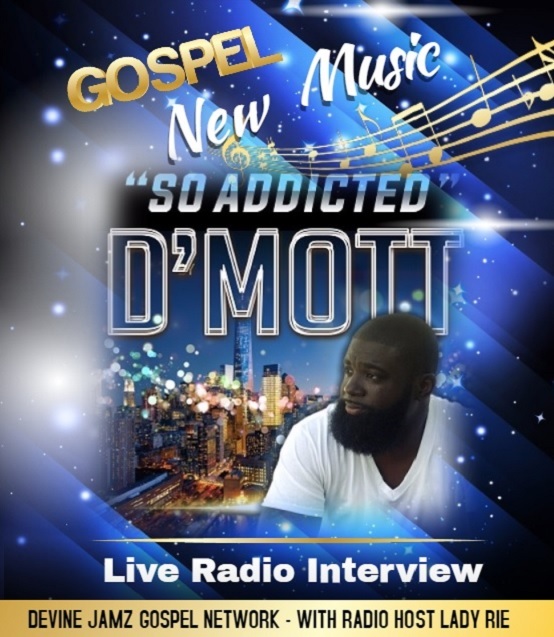 The project “So Addicted” is D’Mott’s first single from his upcoming release “Beautiful Chaos.” “So Addicted” is about D’ Mott’s emergence from the seductive trappings of the world. It tells how God has delivered him from various trials and how blessed he is to minister to everyone in his walk in life. D’Mott has been fenced by Gospel music and a place of worship all of his life. Even as a young child his attributes did not go unnoticed by the church. However, like many that transition into adulthood he took a turn for the worst. D’ Mott allowed his superficial and materialistic desires rule his thinking. It was God’s saving grace that took a hold of D’Mott using his musical talent. He began playing drums at King Solomon’s Holiness Church that his grandmother, the late Rev. Arlene Motley-Spells, pastored. D’Mott carries an anointing that is necessary for this day and time in ministry. So when God chose him for ministry, he didn’t hesitate. Today D’Mott pastors at the Remnant House Outreach Church in Buffalo, New York. He has shared his talents with entertaining icons such as Darwin Hobbs, Beverly Crawford, Bishop Neal Ellis, Bishop Clarence McClendon, Lenny Williams, The Kingdom Comedy Tour featuring Ricky Smiley, Ben Tankard, Earth, Wind and Fire, two singles on “The Scroll Movie” soundtrack featuring TD Jakes, Marvin Sapp, Noel Jones, Wes Morgan, and Al Sharpton. Keep watch for the upcoming release “Beautiful Chaos.” God is not through with D’Mott yet!